Members of illegal armed groups shelled Ukrainian National Guard positions near the village of Marynivka in Donetsk region on Wednesday morning, and fighting is now going on near Tarany. The National Guard press service said the militants mounted an offensive at 0500 from the side of the town of Stepanivka. "A Ukrainian National Guard roadblock near the village of Marynivka in Donetsk region was put under tank, mortar and anti-tank missile fire. The shelling lasted for over an hour. The Ukrainian National Guard repulsed the attack and launched a counter-offensive that forced the attackers to retreat to Stepanivka," the report said. 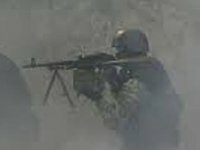 Three Ukrainian National Guard servicemen were wounded in the fighting. Significant damage was done to Marynivka's infrastructure. Hostilities continue in the Tarany area, where the militants are developing an offensive on the National Guard positions from Saur-Mohyla and Stepanivka. The Ukrainian troops are under mortar, tank and anti-tank missile fire. A National Guard serviceman has been injured. "Information about the losses of the militants has yet to be confirmed," the National Guard press service said.